Home Companies Zhangjiagang Wancheng New Material Co.,LTD. 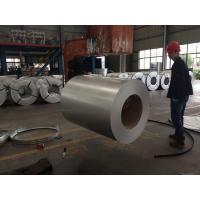 It is a kind of coated steel coil/sheet. With the cold rolled steel of different strength and thickness as substrate, it is produced through applying Al-Zn coat on both faces by hot dip process. In its coating, Al accounts for about 55%, Si 1.6%, while the remaining is zinc. Quality: No Bends, no spots, no roller marks. Coil Weight 3-8 tons or as your requirement. Why Choose Wancheng Metal ? We are leading steel coils manufacture in China and have been in exporting field many years.With advanced technology and strict quality control systems, we produce and supply higher quality according to customers' requirements,till now we have exported to more than 50 countries and regions in the world and set long term cooperation with current customers, we receive glorious reputation from our current customers. So far every customer is satisfied with our materials, therefore we are confident to offer you good quality materials as per different customers' request.So far more and more customers start to use”Wancheng” coils,if you have any steel coils requirement, pls free to contact us !